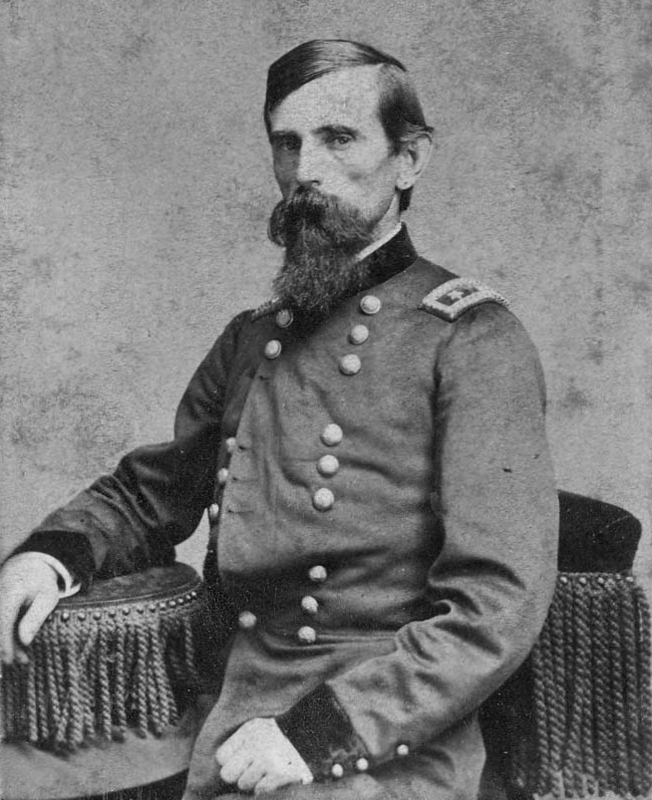 This week has been just chock full of Lew Wallace. So I thought I would share a little bit about this intense and intensely complicated man. Lew’s older brother David was a student at the new Wabash College in the 1830’s. Lew, it seemed, was missing his brother and decided on a whim to visit David in Crawfordsville. He hitched a ride on the back of a horse with his uncle and made his way to Wabash. While some will say that Lew did not attend for any time or that he is not a Wabash man. In what was perhaps a hopeful gesture on his father’s part, the school fees were paid for Lew. As a closer tie, Lew was awarded an honorary degree in 1881, just following his posting as Governor to Mexico. AS to the Civil War, Wallace entered the fight with the enthusiasm of a young man. At the time of Shiloh Wallace was the youngest general in the armies of the north and off to a fabulous start as a young officer. Then came bloody Shiloh and while others have written more elegantly on this awful battle, I would like to say that historians are still discussing Shiloh and Wallace’s legacy in that battle. One of those Civil War historians will be here on campus this Tuesday evening. Lew Wallace was an intensely complicated man with any number of pastimes, hobbies and avocations. All his life, even with his success the world round as an author, he worked to exonerate his good name. Shiloh haunted Wallace, as it must have many a man who was there to see this awful place in the Civil War. More about Lew Wallace next time…. ps Gail Stephens, the author of this latest book on Lew Wallace, will be in Indianapolis on Saturday at the Indiana Historical Society as a part of the Authors Fair and will be presenting at 1:30. Thouroughly versed in all things Lew Wallace, Gail will also be available to sign copies of Shadow of Shiloh. Thanks again to Nate Mullendore for sharing this great old report. A note from my friend, and alum, Nate Mullendore [W2007] is the inspiration for this posting. For the past few years Nate has been the go to guy (officially the Watershed Projects Coordinator) for the Friends of Sugar Creek, a non-profit founded in the 1970’s as an advocacy group for our beautiful river here in Montgomery County. Nate asked if I was familiar with the 1875 Geological Survery of our county – written by John Collett [W1847]…I was, although mostly in passing. “The surface, gently undulating, is carpeted with shrubs and blue grass. The oak and elm forests which prevail on the cold tenacious clays are replaced with a thrifty growth of ash, beach, walnut, poplar, sassafras and sugar trees of superior size. In autumn, when the frost just touches the ripening foliage of the latter, as if by magic, they are at once arrayed in festive robes of glory. The forest becomes a giant parterre, brilliant with a thousand vivid tints of purple, gold and crimson, relieved by a setting of russet and azure, while the emerald carpet is flecked and strewn with drifting leaves ripened to the deepest hues of orange, brown and vermillion. 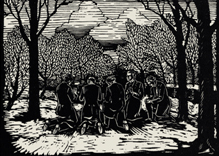 We may well suppose that the citizens of this county rejoice in this thanksgiving scene painted by God’s own hand; and absorbing transfigured inspiration, her theologians and orators have spoken words that have deeply molded human character; that her poets in ·alt and bass have sung songs that have touched responsive chords wherever the English language is spoken. “The sedimentary clays and shales near, but not immediately above the limestone pockets, are rich in fossils. At favorite localities, the bottom of the sea was crowded with life. Armies of Crinoids with strong stems 1 to 20 feet long, yet pliant with life and safely anchored to the solid bottom, lived in great communities in the deep dark waters. Their heads, a wonder of artistic beauty and ingenious mechanism, were supported and surrounded by strong arms divided into fringed fingers, which, elastic with vitality, served at once for defense, and at the same time, with prehensile instinct, grasped and sorted the food which sustained their strange and complicated being. Among the things I will be grateful for this Thanksgiving are the beauty of this area and the rugged beauty of Sugar Creek. Well…how about that Bell Game? 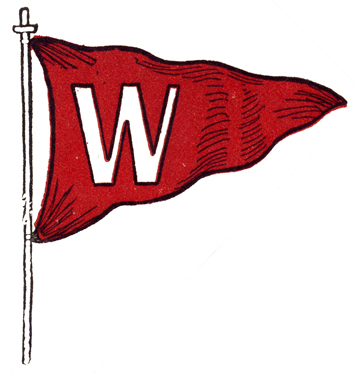 Woo hoo…doing a little victory dance here and waving our W flag!!! In response to the previous posting mentioning Philistine Field, I had a suggestion from a reader that I share what we know about this name, so here goes…. The following are all passages from the book Wabash College, the First Hundred Years. The old wooden fence can be seen clearly in this photograph. 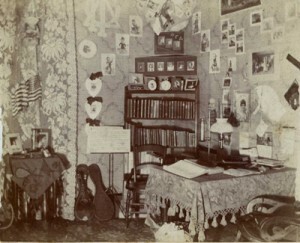 A bit ramshackle indeed.This photograph comes from the Wabash Magazine of December of 1903. I love the story of getting that fence together the day of the DePauw game and that even old Dr. Tuttle worked! 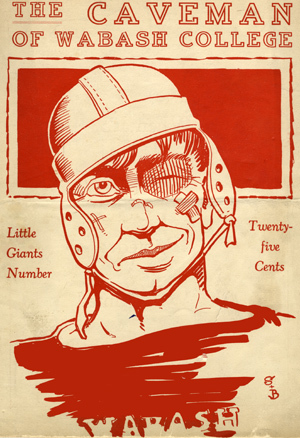 This was the cover of the October 1924 issue of the Caveman, a student humor magazine. I love it for the image of rough and tumble football of that era, plus the color is just wonderfully scarlet. This is Monon Bell Week here at Wabash and the bell is ringing on the Chapel steps (although only during breaks between classes) and the Monon Mohawks and mustaches can be seen on some students. Tomorrow another tradition, Monon Bell Chapel will take place…Let’s just say that the campus is just humming with activity of one sort or another. At Wabash on Philistine Field. I have often written about the many ways I am delighted to share the history of this wonderful place. Often the sharing has to do with advanced technology. Because of scanners and the internet I am able to share a great deal more than would have been the case decades ago. This posting is about a project that will go a long way toward increased sharing. Some years ago for the first Big Bash, I pulled the bound issues of the Bachelor, our student newspaper, in case anyone was interested. A group of three alums walked in, just for a look around, and I offered them the Bachelors from their years here. They started looking through them and suddenly they were 20 again, laughing and sharing reminiscences from 50 years ago. As I thought about this little piece of magic I had witnessed, I had a second encounter with the Bachelors from long ago. A professor brought his freshman tutorial class in to work with the Bachelors for a writing assignment. We spoke about being exceedingly careful with these old papers and for the most part, the students were very careful. Yet when they left the floor was simply covered with little shreds of paper. 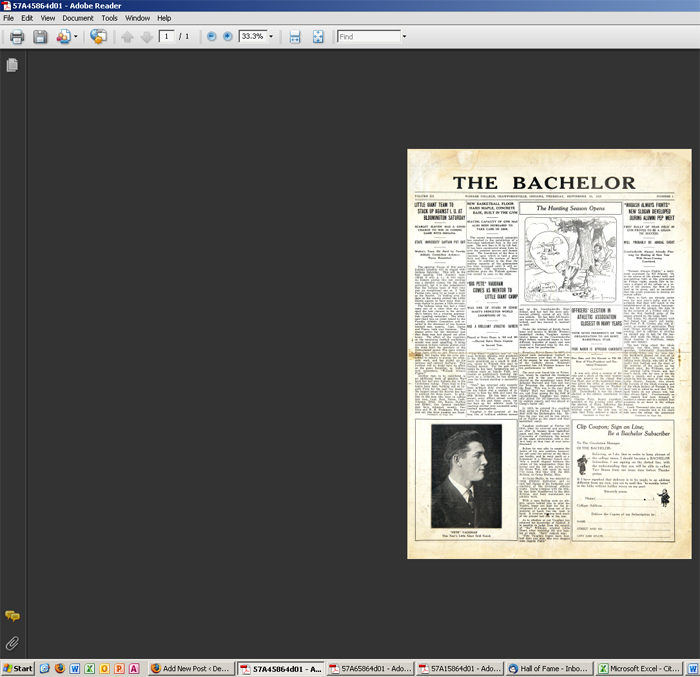 At that point, I limited broad access to our rolls of microfilm. It was clear that a sound preservation and a reliable access strategy were needed. While at a conference of the Society of American Archivists I saw a company that was doing just what we needed done, digitizing and serving over the internet large runs of student newspapers. Of course, a project like this would be costly so for the next several years I spoke with everyone I could about how wonderful it would be to have this for the Wabash family. Although it has been a long time coming, I am so pleased to announce the most incredible project of my career at Wabash (so far:~) and my delight at its debut. Now I have to pause here and tell you that for once, I really did stop at this screen and follow the tutorial and I would highly recommend that you do this as well. There are settings that you will want/need to adjust and it is also a very good way to understand all that this project can do. In terms of searching capabilities it is simply amazing! I can then enlarge the page for reading, save it on my computer or print it. I would encourage you to play with this project and see what you can find…What if you were interested in Commencement of 1958? Just enter that term and that year and it bounces you right to the PDF and suddenly I see the list of men who graduated that year, the speaker, who won honors, everything I wanted to know about Commencement of 1958. In short, a whole world of history opens to our Wabash family and life here in the Archives will never quite be the same! 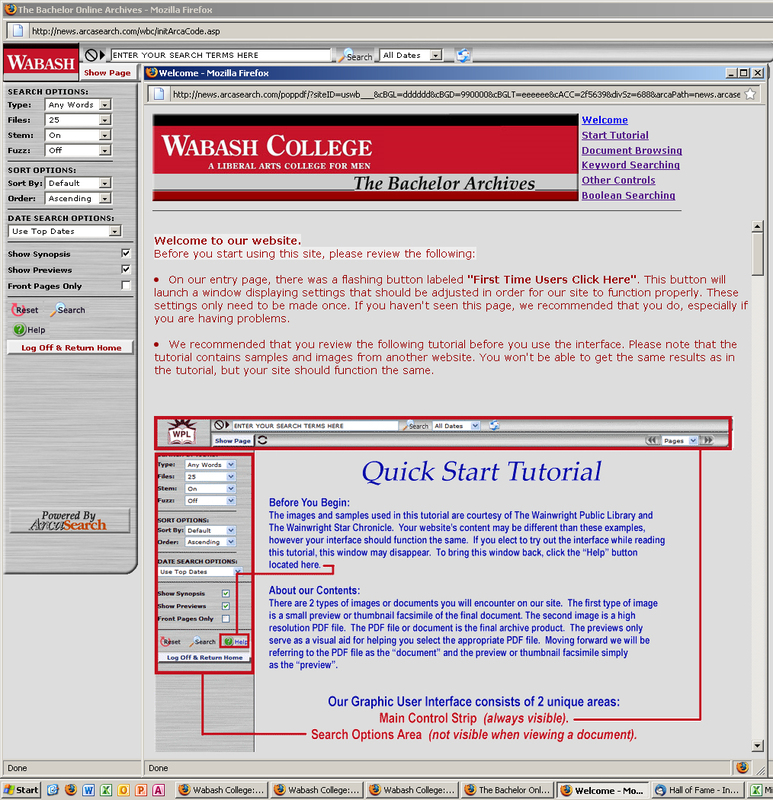 Many thanks to our good donors the Pactors, to Jeff Ruprecht at ArcaSearch for his unflagging optimism, and to Joe Emmick for his patience with my dogged insistence that this was the right project for Dear Old Wabash…Enjoy! While working with some old pictures last week, I came across this little gem and had it scanned. This is the room of James Ray Thomas [W1901] at 606 South Walnut Street for the school year of 1897-98. This would have been Ray’s freshman year at Wabash. It is interesting to note what was considered essential at that time. A mandolin, some pictures of a couple of Valentine beauties and numerous items identifying Ray as a Phi Gamma Delta man. From the Wabash Magazine of Ray’s senior year, we learn that he came to Wabash from Raton, New Mexico and that he spent the summer before his senior year traveling in Europe. 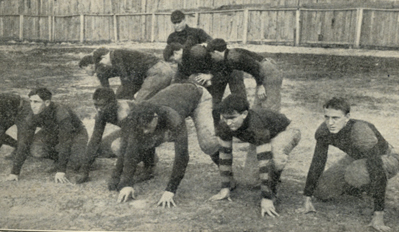 It was his intention at that time to study medicine in Chicago immediately after his graduation from Wabash. We also learn that his mother of Raton, New Mexico and his sister, Miss Alice Thomas of Northwestern University, attended his commencement. Late in the first decade of the 1900’s the college sent out questionnaires to all of the alums it could reach. 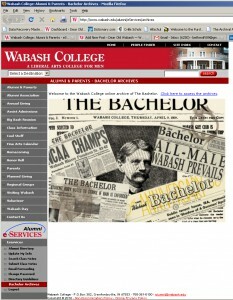 The responses are a real treasure trove of information about Wabash men as they faced the 20th century. Ray answered that, following his graduation from Wabash, he attended Purdue University earning his bachelor of science degree in electrical engineering. In 1903 he also accepted the position of Superintendent of the Crawfordsville Electric Light and Power Co. This fits with the listing from the 1912 Alumni Directory which shows him as the City Electrician. I should add that one other item added to his items of general interest since graduation category was this, “Founder of the Purdue Chapter of Phi Gamma Delta.” He also notes that in 1904 he married Miss Mary Elizabeth Kenyon of Crawfordsville. By1932 our directory shows him as President of the Thomas and Skinner Steel Products Co. located at 1120 East 23rd Street. It seems that James Ray Thomas founded a company that lives on today. What a neat story from one odd little picture!